Ithaca Mayor Svante Myrick ’09 was transported to Mexico City, Mexico on Thursday by visiting the Portal at Cornell, speaking about U.S. international relations during the Trump presidency with political consultant Luis Daniel Perez Vazquez. “In the age of Trump — which is an age of people putting up walls and deciding that national identity is more important than your identity as a human being — anything that can bring you face to face with somebody who is very different from you and makes you feel like you have more in common than what separates you is a good thing,” Myrick said, in an interview with The Sun. What better fun can you have in a shipping container? New York tech company, Shared Studios, has set up its first Australian portal at the old Royal Adelaide Hospital. 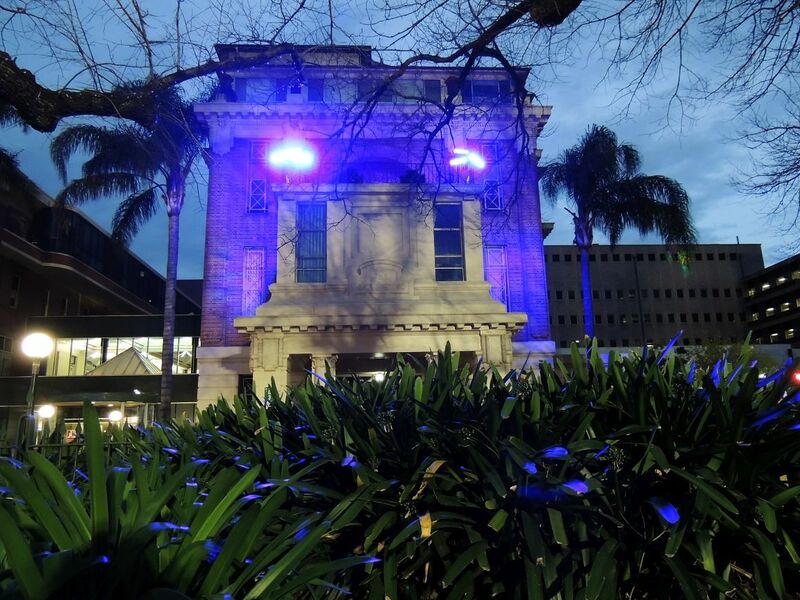 The Adelaide Portal is sponsored by Renewal SA, the government's Department for Parties to 'activate' the site while it starts to demolish the non heritage listed buildings on the site. It follows on from an earlier activation event, The Hive at the RAH. Portals are a world wide phenomenon created by Shared Studios. They are a series of installations that allow people to interact with others in real time through connected portals around the world. 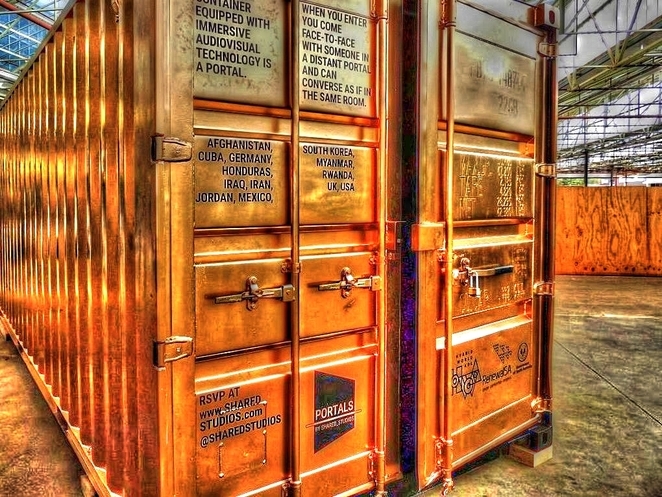 The distinctive gold painted shipping containers used as portals are filled with immersive technology. Shared Studios promise that when you enter a portal, you will come face-to-face with someone in a distant portal "live and full-body, as if in the same room". The free Adelaide Portal was first seen at Hybrid World Adelaide at Tonsley in October last year. It must have made an impression then, now finding a new home at the former Royal Adelaide Hospital in Adelaide's east end. When you enter the gold painted portal, you have the opportunity to meet with people in other portals around the world free of charge. From New York to Palestine, from universities to refugee camps, the shipping container portal lets users immerse themselves in real-time conversations to entertain, challenge and delight. Fortunately it's not at all like the random conversations that Microsoft Netmeeting brought a few years back, when you were just as likely to get an x-rated encounter. While the portal at the former Royal Adelaide Hospital is housed in a gold shipping container, there are around 20 other portals operating in the world at any given time. Some of the others are also in shipping containers, but there is also a portal bus, inflatable portals, and portal screens. The Adelaide Portal can fit four adults comfortably at a time, or more if the people are children. You can communicate however you like while you're online - talk, dance, sing or draw, it's up to you. If a translator is needed, one will be provided. It is possible to connect to more than one location at once, but normally one destination works best. It's recommended that you book in advance to use the free Adelaide Portal. Bookings are made in 20 minute slots, and the Shared Studios booking website will show you which part of the world the portal connects through at the time of your booking. It's possible to choose times from Thursday to Saturday until March, with the full schedule available when booking. For more information about the Adelaide Portal, head over to the Adelaide Riverbank Facebook page. There's much more about the portal and its origin on the Shared Studios website, or you can just book your time here. During February and March the Adelaide portal will be hosting the Fringe on World Tour event and be open on some Saturdays at differing times. Check the Facebook event website - plenty of entertainment, food, and drink will be on hand, stay tuned for more details. After you have finished making new friends around the world in the portal, why not take a look at the old Royal Adelaide Hospital site, and take a last look at how it once was. Its future is still unknown at this time, despite several public consultations and a worldwide competition. 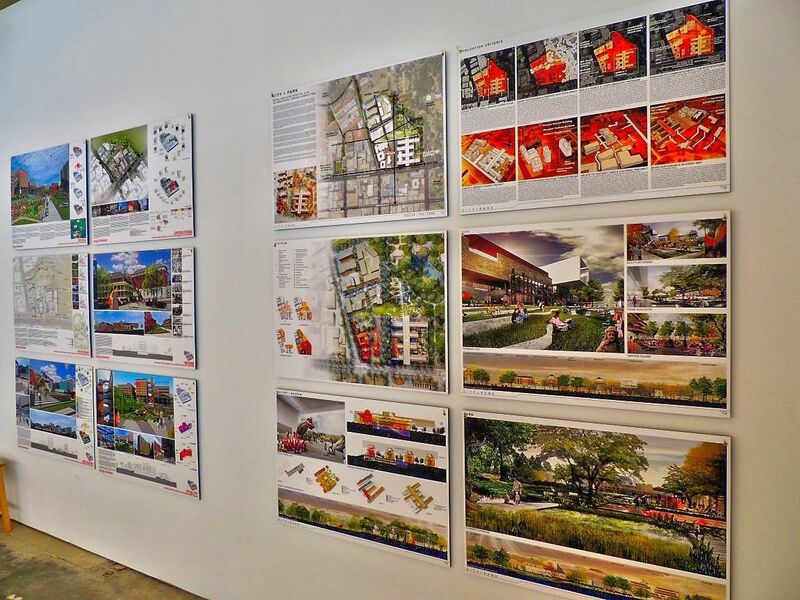 Most people believe that the site should remain in the hands of the community, an extension of the existing cultural boulevard, rather than being wasted on housing. InAVate: Interview: How are ‘Portals’ making the world a smaller place? A Portal is essentially a gold space – more often than not a shipping container but they come in numerous forms: inflatable rooms, repurposed huts, a single screen, even a bus. Walk inside and generally you’ll find an NEC short-throw projector, Biamp Devio microphones and Community loudspeakers. Behind the scenes Zoom videoconferencing is at work. All manufacturers are working as sponsors of the project. A hackathon set to be held next week is bringing together students and medical workers in Baltimore and Gaza City. It won’t involve travel. Instead, the key to link lies within a gold shipping container. Known as Portals, the retired cargo transport vessels allow groups of people from different sides of the world to sit down for a conversation. The proposition next to the radiant, gold-painted shipping container is simple and inviting. "Portals" the sign reads. "Step inside and engage people around the world, live, as if in the same room." From a sun-drenched quad on Johns Hopkins University's Homewood campus, Portal visitors are transported—with the help of a floor-to-ceiling video screen and immersive audiovisual technology—to a location outside Erbil, Iraq, where four men sit inside another Portal. A Portal equipped with audiovisual technology that makes immersive, real-time, cross-continental conversations possible was installed on Decker Quad at JHU's Homewood campus on Monday. Imagine: Dancing next to a life-size figure, your iPhone blaring a favorite tune. But the person facing you isn’t there. She’s thousands of miles away in Iraq, tucked in a room much like yours. And yet together, you share a moment. Or imagine this: Turning a $3 webcam into a microscope that can film the universe blown up large. In a lab, you tinker with little pieces of technology until the focus is just right and your camera records the minutiae you want it to see. The world is your oyster, in all its detail and design. At Greenwich Academy, two teachers have pioneered initiatives that make both of these hypotheticals a reality. And last week, they dodged a nor’easter for a few days in Austin, Texas, where they shared their knowledge at South by Southwest. Education often brings students to new places, but it looks like that may be more true than ever for Andover students in the coming months. The Andover Coalition for Education, or ACE, has funded a portal through Shared Studios, an organization that creates spaces with technology and connects people internationally. The inflatable portal is equipped with video and audio technology that allows people inside the inflatable, yellow portal to communicate with people in other portals around the world. There are currently 47 portals around the globe. "The real innovation is in the global network of Portal sites around the world," explained the school department's Director of Strategy and Innovation Stephen Chinosi. "Having access to people who are interested in connecting with others to build 'real' relationships and potential partnerships. The Portal is using the best technology to actually connect people through focused and open dialogues. The experience is nothing like a Skype call, which only focuses on the head/shoulders. The Portal feels like you're in a room with someone who happens to be on the other side of the world." here will be plenty of "wow" at this year's Imagine Solutions Conference.There's even a presentation called "WOW," which will feature an interactive presentation by a "mathamagician." Another wow moment in the waiting: A golden portal — in a shipping container — that attendees can walk through and come face-to-face with people inside sister portals around the globe. The annual conference, sponsored by the Searching For Solutions Institute, a public foundation, is Monday, Feb. 26. It will once again be held under the big tent at The Ritz-Carlton Golf Resort in North Naples. Imagine global saviors on the brink of curing cancer, on the cusp of integrating technology in ways that seemed, well, unimaginable just few years ago. Big names with resumes packed full of life-changing accomplishments will gather at the Ritz-Carlton Golf Resort in Naples on Feb. 26 to talk about the future of healthcare, technology, education and affordable housing as part of the 8th Imagine Solutions Conference. For eight hours, guests will learn about cancer breakthroughs and solutions, the longevity of life and if a 100-year life expectancy is approaching, how science and technology continue to integrate and create endless possibilities and how education shapes all that is possible. Can you imagine traveling to another city in the world without leaving Panama? A project called "portal" container allows to travel or interact in real time with people in other parts of the world. El W Panama Portal lanzó por primera vez su tecnología audiovisual inmersiva en Ciudad de Panamá, Panamá, en alianza con W Panamá y Shared_Studios. El Portal está ubicado en el Street Mall, en avenida Israel y abrirá de forma gratuita, dando la bienvenida a todos los locales y visitantes de enero a marzo de 2018. El Portal, creado por el colectivo de arte, tecnología, y diseño llamado Shared_Studios, es un contenedor dorado de carga único en su clase que cuenta con innovaciones patentadas en hardware, software y diseño. El portal ofrece una nueva forma de conectarse con personas en más de 18 ciudades, desafiando los límites físicos y culturales. Today (21 November) is the last chance to stop by the TimesSquare_Portal project, a golden shipping container that connects visitors in New York’s busiest public space with people around the world, using advanced video chat software. During its seven-week-long run, the portable communications hub has linked up to cities in the US as well as Iraq, Afghanistan, Rwanda and Myanmar. Portals was created to foster one-on-one conversations across distances and different cultures, says the project’s founder and creative director Amar Bakshi. Todo comienza en una cabina dorada. Portales es una iniciativa de arte público creada por Amar Bakshi y Michelle Moghtader; son espacios y pantallas equipadas con tecnología audiovisual inmersiva. La idea es que la gente se acerque para platicar con personas de otros lugares cara a cara con la intención de saber cómo es la vida en otra parte de su país o del mundo. Even before Internet ubiquity, in the mid-1990s, when I was in third grade, students who finished bookwork early (young nerds like myself) were sent to the back of the room – where the (one lonesome) computer was located – and given access to a digital rendering of the entire world, led by the intrepid Carmen Sandiego. When Shared_Studios brought its Portals project to Times Square last month, it brought in one of its star curators to take a turn on Broadway. Lewis Lee, who with his generous and engaging nature embodies the Portals mission to connect people around the world, flew in from Milwaukee to connect visitors with friends and strangers. Or more specifically, strangers who become friends. Broadsheet: What’s Inside This Curious Gold Shipping Container? North Terrace’s old RAH building is now abandoned. Its doctors, nurses, patients and beeping machines have moved into new state-of-the-art digs just down the road. The place is suddenly quiet and more than a little eerie in their absence. On the forecourt – somewhat obscured by roadworks – a mysterious gold box has appeared.